Every now and then, a member of our staff turns up at a news-stand, produces oldstyle coin or paper money and buys the odd magazin or newspaper. Strictly singular for we have canceled all subscriptions we have ever had. And while tinytalk plc. has completely given up on killing trees and printing on rags many years ago, our stuffers still enjoy reading in the bathing tube and on the occasional busride, both environments, we deem, where print on paper in all its ruggedness, flexibility and its lack of disturbing links still has the advantage when it comes to the enjoyment of consuming what talented professional writers, photographers and art department people are still able to communicate by these outdated means. The gems get fewer but are still there. On weekends more often then on workdays. Long introduction aside, what we really have come to write about today, is a grand special that the Economist, which is in the list of print products we occasionally peruse, put together for its latest number. That special is about the future of news media, a topic we are obviously interested in. Here then be the link to their special report that tries to explain, how the news industry is returning to something that might be closer to the coffee house of yonder years. Give it a try, it is worth the read and justifies the money that we have spent despite of online free content and all. 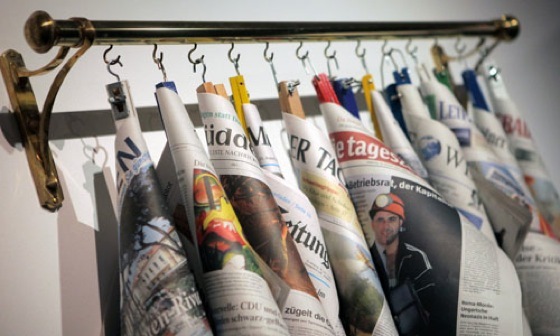 All of this sure rings a bell with us, for, at least as students and as budding professionals we have read far more issues of the Neue Zürcher Zeitung, Le Monde, the New York Times and the Daily Gleaner in a coffeehouse than at home. It is a pity that the scan of the Economist's front in the online edition is so badly resolved. We think it is nice drawing: I saw her on ThouTube. 'Twas Ghastly. - I hear Tom Paine's all a-twitter. - Wilt Thou be my Visagebook friend? Funny to old farts like us, for sure. The special also provided us with a nice new acronym for our glossary of unusual vocabulary and acronyms in tinytalk (GUVAIT): PFKAA, pronounced pee-eff-kaa, meaning: People Formerly Known As The Audience. Before that we used to call them KTMIFO (kay-tee-myfo), the krill that the media industry feeds on. Definitely a move to the better (DMB).